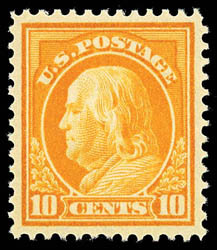 1912, 10¢ orange yellow, o.g., never hinged, perfect centering within evenly balanced margins, rich deep color, fresh and pristine, Extremely Fine to Superb, a wonderful never hinged gem; with 2015 P.S.E. Graded certificate (XF-Sup 95, SMQ $550). 1914, 50¢ violet, o.g., never hinged, precision centering amid wide well balanced margins, rich deep color on bright paper, Extremely Fine to Superb; with 2005 P.F. certificate. AN EXCEPTIONAL NEVER HINGED EXAMPLE OF THE 1914 50¢ FRANKLIN ISSUE. 1914, 50¢ violet, top margin plate block of 6 with plate number "7057", o.g., top center stamp very lightly hinged, others never hinged, choice overall centering, vivid rich color on fresh paper, Extremely Fine; with 2015 P.S.E. certificate. 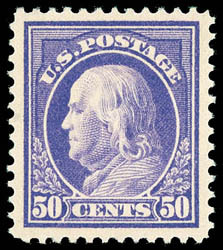 WITHOUT QUESTION, ONE OF THE FINEST EXAMPLES OF THE 1914 50¢ VIOLET IN TOP MARGIN PLATE BLOCK FORMAT. 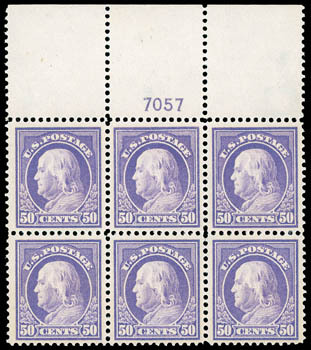 1912, $1 violet brown, block of 4 with horizontal guideline, Post Office fresh o.g., hinge remnant (very small on left stamps), choice centering amid wide margins, rich color and proof-like impression on bright fresh paper, Extremely Fine and choice, an Outstanding Block; with 2015 P.F. certificate. 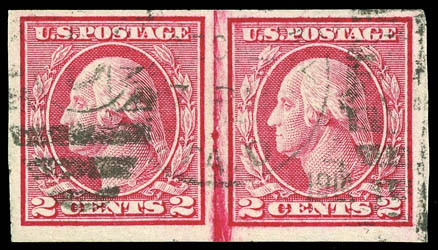 1915, 2¢ red, type I, rotary coil, vertical line pair, 1918 R.P.O. town cancels, exceptional centering for this typically off-centered coil, bright distinctive color, Very Fine to Extremely Fine, the only example to receive this ultimate grade with none higher, ex-Anderson, N. Grace; with 1992 P.F. certificate and 2007 P.S.E. Graded certificate (VF-XF 85, SMQ $32,500). CONSIDERED TO BE THE FINEST USED EXAMPLE OF THE 1915 2¢ TYPE I ROTARY VERTICAL COIL LINE IN EXISTENCE - A GREAT 20TH CENTURY COIL RARITY. This quintessential used coil line pair sold in the Siegel 2012 Natalee Grace Collection of Used U.S. Stamps sale for $30,000 hammer. It is believed that only eleven coil line pairs in used condition exist, most of which are faulty, or if sound with perfs cutting into the design. 1916, 3¢ violet, rotary coil, horizontal line strip of 4, o.g., left and right stamps h.r., center line pair never hinged, beautifully centered, bold color and Post Office fresh, Extremely Fine, a choice pristine line pair; with 2015 P.F. certificate. 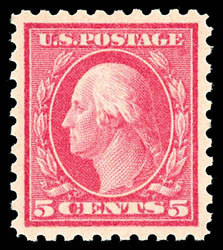 1916, 5¢ carmine error, o.g., never hinged, perfect centering amid large evenly balanced margins, rich radiant color and Post Office freshness, a Superb gem, the sole never hinged example to receive this superb grade with none higher (with the next highest grade being a 98); with 2013 P.S.A.G. and 2015 P.S.E. certificates, both Graded (Gem 100, SMQ $25,000). WITHOUT QUESTION - THE FINEST MINT NEVER HINGED 1917 5¢ CARMINE PERF 10 ERROR IN EXISTENCE. 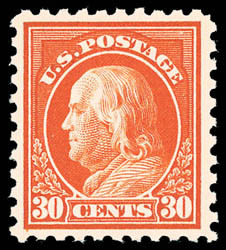 1916, 30¢ orange red, o.g., never hinged, choice centering amid wide margins, rich intense color and Post Office fresh, Extremely Fine; with 1984, 1997 and 2006 P.F. certificates, the later Graded (XF 90, SSV $12,250). Scott No. 476A $4,500 for the grade of fine. BY FAR - ONE OF THE FINEST EXAMPLES OF THE 1916, 30¢ ON UNWATERMARKED PAPER. It is believed that the Scott 476A came into existence during the transition from gauging perforation 10 to 11 and the use of the new unwatermarked paper. 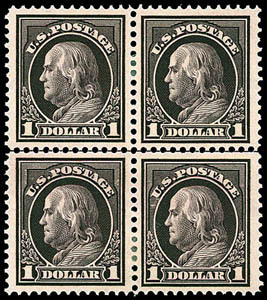 Although the Bureau does not record producing such an issue, it is evident that at least three different unwatermarked sheets where used, creating the 209 issued stamps (top right pane of 100 from plate #6911, bottom right pane of 100 from plate #6917, two left sheet margin blocks of 4 and a bottom margin single from plate #6914. 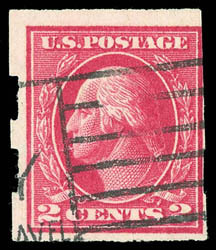 The far majority of these stamps are off-centered and is the reason for the Scott catalog valuation in the grade of fine, with only a few truly extremely fine examples extant.